Tiffany Barnett White is Associate Professor of Business Administration and Advertising and Bruce and Anne Strohm Faculty Fellow at the University of Illinois, College of Business. 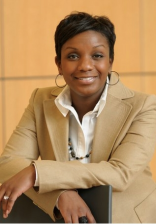 She joined the faculty at Illinois in 1999 and received a Ph.D. in marketing from Duke University in 2000. Professor White holds M.S. and B.S. degrees in advertising from the University of Illinois. Her teaching and research interests are in the area of consumer psychology. Her research addresses affective cognitive and behavioral aspects of consumer-brand relationships and has been published in major marketing journals, including the Journal of Marketing, the Journal of Consumer Psychology and Psychology & Marketing. Professor White has been invited to present on the topic of branding and brand management to national and international audiences. Her research on the “Brand Connected Consumer” is a featured TEDx presentation (available for viewing on youtube.com). She is an award-winning teacher and is consistently featured on the University-wide list of faculty rated as excellent by their students. Professor White served as Secretary-Treasurer for the Society for Consumer Psychology and is a member of the Editorial Board for the Journal of Consumer Psychology, the Journal of Service Research and the Journal of the Academy of Marketing Science. The At-Large Directors participate in and vote on all matters put to the ACR Board of Directors and attend the annual Board of Directors meeting held at the North American conference. Responsibilities include voting, budgets, recommendations to the Board, and evaluating grants and donations.